I'm curious does the AJR and MR18 use the same tire as the GT3 and endurance packs? Also how do those cars compare to the Oreca and Norma? I asked on the rf2 forum for a guy that posted screen shots, but he didn't answer. sorry that was me. yea I cant talk much about that and shouldn't of really posted them. my bad..
answer to your question is im not entirely sure. I figured there was some NDA about it or something. I'm hoping they compare well so it adds more depth to the prototype classes. If they are both well behind than I fear they could get lost in the shuffle. Hopefully they are BoPed well. It would be pretty cool to see more than one make in both proto categories. "That guy" wasn't supposed to post those screens or talk about the beta. As far as I can tell they are working on fixing some issue (common in beta stage) and fine tuning others. Cars and tracks looks awesome, the only thing I feel free to say is that those models are so well optimized and lighter than S397 one's that my FPS counter passed from 70 with official content to 120 with Reiza one. Well tire is up to Reiza, they can build good ones, the game allows that. Same about right/left for the MCR. Gear box.. if anyone expected it the person must be just dumb, sorry. This isn't modeled in rF2 so unless S397 coded it there was nothing Reiza could do thus no reason to expect it. A few of us in the rF2 forums have been discussing our wishes for an updated gear-box / drive-train physics model that provides more realistic behavior and elasticity. I asked Marcel about it some time ago but, never received any response. It's disappointing that rF2 doesn't have such features as iRacing, RaceRoom and now, ACC demonstrate but, I'm not sure many players are even aware of how race-cars behave as it relates to the drive-train. The differences are far more obvious when a motion-rig is involved but, it's mostly limited to audio cues for the majority of users and few developers seem willing to invest the resources to provide the fundamental physical modeling needed. Still, as more sim-racer's acquire some form of motion hardware, increasing demand may become a factor going forward. I would think it more practical to do the coding sooner rather than later. Can someone explain me the difference between AMS and rF2 about the gearbox ? The rF2 bundle has 3 of the 6 cars with a H shifter, so it can help me in my decision to buy or not. The MCR in rF2 does have an upgrade option for right or left hand seats. Are you expecting a late March release for the DLC? Also will the AJR and MR18 have position panels like the endurance pack cars have? On the content side we should be release ready by the end of the week, then it’s up to S397 to decide when its best to slot it in on their own schedule. As for position panel in the Metalmoros, its a no as they dont use it in the series they run. Someone knows if the templates will be the same as the AMS templates with few corrections for rF2 or if will be new templates? 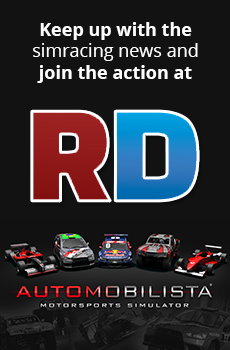 Hi i buy all DLC + automobilista season pass and my question is the reiza pack for rfactor 2 is free if i have the season pass automobilista ? Please use the search function before posting again.